And every week I’ll pick a post that caught my eye and share it down there in my side bar – see where it says “Featured Five Minute Friday”? Yea -that could be you! Hop on over and visit some folk who make fireworks in just five minutes. They inspire me. I also have some Five Minute Friday stories from participants I love to share each week – I can never get over the community that has grown up over a five minute writing exercise. 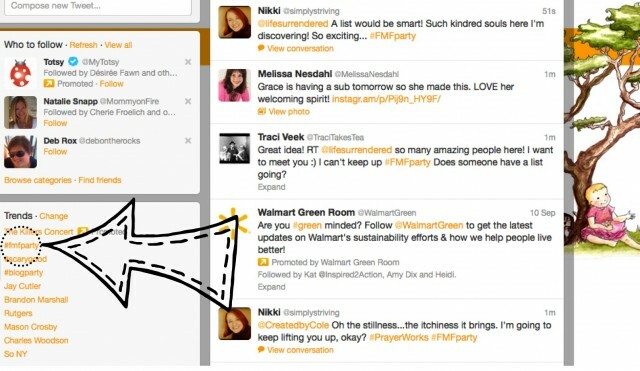 Last week hundreds of folk joined in a pre-party at 11pm EST on Twitter connecting with the hashtag #FMFParty and ended up trending on Twitter! How fun is that?! Got a FMF story you want to share with us? Email me. We run toward the ocean with arms wide open, hands clasped, laughing crazy on the sea wind that’s whipped hair and hearts and memories all around. The wet sand imprints on more than our toes. 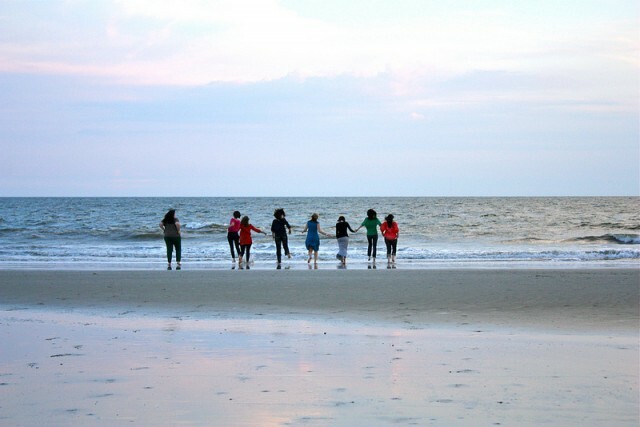 We run and sing with the gulls, free and full of the joy of knowing sisterhood that transcends DNA. Words can build a bridge, a family, a community safe for everyone, just as they are. You and you and you and me, with the crooked grin and the new jeans and that belt that makes me feel the tiniest bit trendy. We run together with arms wide open and there’s always room for one more. On the sofa later we’ll talk about being left out or worried about leaving others. We’ll cry and then someone will share more than anyone else imagined they might learn on certain topics and the laughter will peal through the living room until tears wash it all clean again and this is life. Broken, hard, beautiful. Sand between the toes and salt on the cheeks. Women who aren’t afraid to love big, to serve hard, to hold on, to lift up, to bend down low over the feet of their sisters. It’s never a competition in the Kingdom. It’s always a co-op. When one flies the others fly all the higher, catching her current and soaring toward the sunset. All this glorious fire in the skies tonight. Passion to rival the heavens in the hearts of 20 girls who all still feel 17 on the inside. We are none of us there yet. We are all of us still learning make up tricks from the other. Borrowing curling irons. Practicing eye liner tricks. This is the safe place. Inside the inside of the open arms. This is the gift. It costs nothing and everything to give. All of me for all of you. I throw back my head and laugh and run and the waves rush up my legs and the water is so much warmer than I was expecting. 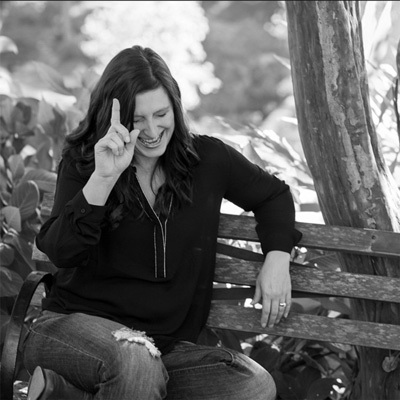 oh this community, love, sisterhood and friendship…it makes my heart beam and am so thankful for my friends. “Sisterhood that transcends DNA” So very true!! I love your description of this community co-op. I’ve read different accounts of your time at the beach that time from several of the other bloggers present. The theme is always the same; one of love for one another. That’s how it should be within the body of Christ. I love this post…the image of all those women together, supporting each other, being the church–on a beach! :) I love “salt on our cheek” and “inside the inside of open arms” perfect! Wide and wonderful words here, Lisa Jo. Makes me feel all warm and wanting to go spilling into into more hearts–and that water. I love your word; absolutely beautiful. The wide open arms of friendship; women who bond and form a sense of being sisters….I think this is a beautiful thing, when it happens. I am fortunate enough to have three such friendships; my sister,and two close girlfriends. Loved this topic. I am really enjoying this. Thanks for hosting it. Love this! I long for a group of women friends who are there for each other, thick and thin, to encourage, laugh, live, dream, serve, and pray together. This reminds me of a favourite song of mine. A song I love to listen to when I am feeling particularily human, sahmeful, and not enough. It is a song m\by Tenth Avenue North and the chorus states, “Your love is over, it’s underneath, it’s inside and it’s between . . .” Wow! The thought of that truth, radiates a powerful contented pease throughout my body. How blessed, how lucky, how loved am I! God, loves me, entirely. He loves me in my great need, He loves me when I do the unimaginable, He loves me when I have no love to give, to myself or anyone else, including Him. And that love, the reassurance of such truth, is life-changing, and just what I need to hear. Everyday of my life. “It’s never a competition in the Kingdom. It’s always a co-op.” Love this! As always, thanks for hosting Five Minute Friday–my heart leaves fuller every week. I love the variety of thoughts that each word brings to mind from all of the participants in each Five Minute Friday :) Sometimes, I’m surprised that many of us write similar things, and other times I’m amazed at how different we are from each other – yet we can still appreciate and even celebrate these differences! I love this kind of writing. Thanks for hosting. *blush* I am SO tardy… is there an award for being the most tardy? ;) Had a long weekend, but I didn’t give up!